Commissioner in charge of competition policy, Margrethe Vestager, said: "We believe that Gazprom's commitments will enable the free flow of gas in Central and Eastern Europe at competitive prices. They address our competition concerns and provide a forward looking solution in line with EU rules. In fact, they help to better integrate gas markets in the region. This matters to millions of Europeans that rely on gas to heat their homes and fuel their businesses. We now want to hear the views of customers and other stakeholders and will carefully consider them before taking any decision." Gazprom is the dominant gas supplier in a number of Central and Eastern European countries. In April 2015, the Commission sent a Statement of Objections expressing its preliminary view that Gazprom had been breaking EU antitrust rules by pursuing an overall strategy to partition Central and Eastern European gas markets. In the Commission's view, the commitments offered by Gazprom cover its competition concerns. They help to better integrate Central and Eastern European gas markets, facilitating cross-border gas flows at competitive prices. Gazprom cannot act on any advantages concerning gas infrastructure, which it obtained from customers by having leveraged its market position in gas supply. The Commission now invites all stakeholders to submit their views on the commitments within seven weeks of their publication in the Official Journal. Taking into account all comments received, the Commission will then take a final view as to whether the commitments are a satisfactory way of addressing the Commission's competition concerns. If this is the case, the Commission may adopt a decision making the commitments legally binding on Gazprom (under Article 9 of the EU's antitrust Regulation 1/2003). If a company breaks such commitments, the Commission can impose a fine of up to 10% of the company's worldwide turnover, without having to prove an infringement of the EU antitrust rules. The Commission's Statement of Objections set out three main competition concerns. Gazprom's commitments respond to these concerns. It has committed to observe the commitments for eight years. The Commission has concerns that Gazprom imposed territorial restrictions in its supply agreements with wholesalers and some industrial customers in eight Member States (Bulgaria, the Czech Republic, Estonia, Latvia, Lithuania, Poland, Hungary and Slovakia). These restrictions prevent the free trade of gas within Central and Eastern Europe. Remove market segmentation -Gazprom will remove all direct and indirect contractual restrictions that prevent its customers from re-selling gas they have bought across borders, or make it economically less attractive for customers to do so. This means that in addition to removing restrictions on gas re-sale (e.g. export bans, destination clauses), Gazprom will remove all clauses which reduce its customers' business incentives to re-sell gas (e.g. where Gazprom would get a share of the profit from re-selling). Gazprom will also not to reintroduce such clauses in the future. Facilitate market interconnections with Bulgaria – The provisions in Gazprom's contracts on the monitoring and metering of gas in Bulgaria have isolated the Bulgarian gas market from the neighbouring EU gas markets. Gazprom has committed to make changes to the relevant contracts. This will put the Bulgarian operator of the gas transmission infrastructure in control of the cross-border flows of gas and facilitate interconnection agreements between Bulgaria and its EU neighbours, in particular with Greece. Create opportunities for more gas flows to the Baltic States and Bulgaria – If customers want to re-sell gas across borders, they need access to gas infrastructure in order to ship the gas. Bulgaria and the Baltic States currently lack access to such interconnections with their EU neighbours. Gazprom has committed to give relevant customers in Hungary, Poland and Slovakia the possibility to ask for delivery of all or part of their contracted gas to entry points into the Baltic States and Bulgaria. This would enable customers to seek new business opportunities in the Baltic States and Bulgaria, even before the connecting gas infrastructure becomes available. Gazprom would be allowed to charge a fixed and transparent service fee, in line with what it would typically charge for such services in the market. 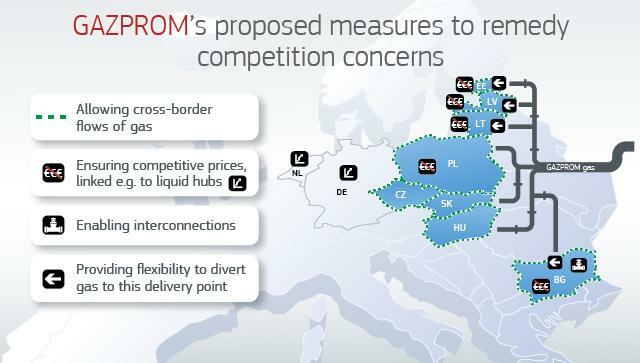 The Commission has been concerned that the territorial restrictions have allowed Gazprom to carve up the market, as a result of which it may have been able to pursue an excessive pricing policy in five Member States (Bulgaria, Estonia, Latvia, Lithuania and Poland). Gas prices linked to competitive benchmarks:Gazprom will introduce competitive benchmarks, including Western European hub prices, into its price review clauses in contracts with customers in the five Member States. Price review clauses enable customers to request changes to their gas price. The commitments will give the customers an explicit contractual right to trigger a price review when the prices they pay diverge from competitive price benchmarks. This would ensure competitive gas prices in these regions in the future. More frequent and efficient price reviews:Gazprom will increase the frequency and speed of price revisions. For those contracts, for instance in the Baltic States, where price revision clauses do not currently exist, Gazprom will introduce clauses reflecting the above elements. Finally, the Commission has concerns that Gazprom leveraged its dominant market position on the gas supply market to obtain advantages relating to access to or control of gas infrastructure. The Statement of Objections raised concerns in relation to the South Stream project in Bulgaria and the Yamal pipeline in Poland. Removes Gazprom's demands - As regards South Stream, Gazprom has committed not to seek any damages from its Bulgarian partners following the termination of the South Stream project. This is without prejudice to whether such claims would have been valid in the first place. As regards the Yamal Pipeline, the Commission's investigation has shown that the situation cannot be changed by this antitrust procedure due to the impact of an intergovernmental agreement between Poland and Russia. To better deal with future international agreements, the Commission has put forward in February 2016 a legislative proposal to make intergovernmental agreements subject to prior scrutiny by the Commission. The proposal has been adopted by the European Parliament on 2 March 2017 and is now pending with the Council (see also the Commission press release welcoming the political agreement reached in December 2016). Please also see country-specific Factsheets that explain how the commitments would benefit each Member State concerned: Bulgaria, the Czech Republic, Estonia, Latvia, Lithuania, Poland, Hungary and Slovakia. The full text of the commitments is also available on the Commission's Competition website. A summary of the proposed commitments will be published in the EU's Official Journal. More information is available on the Commission's Competition website, in the public case register under the case number 39816.